Flowers left on a bench in memory of Hull student Libby Squire are to be used to make potpourri. The 21-year-old's body was found in the Humber Estuary last Wednesday, seven weeks after she went missing following a night out in the city on 31 January. Ms Squire was last seen on a bench on Beverley Road and the floral tributes were left there in her memory. Hull Community Church said it would give away the potpourri to her family, friends and the community. Posting on Facebook, the church said Ms Squire's parents, from High Wycombe, Buckinghamshire, had asked "if we could make sure the flowers didn't go to waste or be left to fade". "So with their blessing, we are taking the flowers to church for Mother's Day and turning them into rose-scented potpourri... roses were Libby's favourite flower. "We are collecting up all the cards and messages and giving them to Lisa and Russ. Nothing will be wasted or thrown away." The church said it was also planning "a more permanent remembrance to the life of Libby", possibly a new bench. An inquest into Ms Squire's death was opened and adjourned on Monday, when police confirmed the case was being treated as a "homicide investigation". 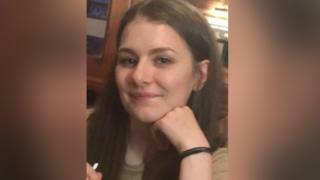 On the night she disappeared, detectives believe the student got a taxi from the Welly Club to her home in Wellesley Avenue at about 23:30 GMT. She was spotted 10 minutes later on CCTV near the bench on Beverley Road, close to the junction with Haworth Street, where it is thought a motorist stopped to offer her help. Her body was recovered on Wednesday afternoon, close to Spurn Point, near Grimsby Docks.